With the locomotive withdrawn from service prematurely at the end of 2016 primarily with weeping small boiler tubes; the society has been working tirelessly behind the scenes to find a resolution to the situation. Whilst the locomotive has been out of action, 6201 Princess Elizabeth has been at The Princess Royal Class Locomotive Trust’s (PRCLT) West Shed at the Midland Railway Centre, awaiting attention. However, since PRCLT’s workshops are busy with other high priority repair work, including major repairs to their own flagship Stanier Pacific Duchess of Sutherland, the decision has been taken to transfer the locomotive to Carnforth. So on 22nd February Lizzie was moved, top and tailed by a matching pair of West Coast Railways class 37 diesel locomotives, via Lichfield Crewe and Preston up the West Coast Mainline that she knows so well. There were no issues en-route, and the train arrived at Carnforth over 2 hours earlier than scheduled. 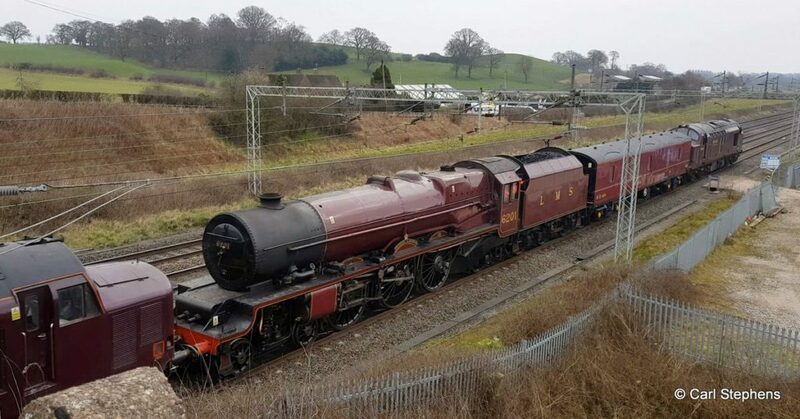 6201 Princess Elizabeth now needs your continuing help to complete the fundraising for the two ongoing appeals (Small Tubes + Blower Valve / Ejector Ring) and to provide funds to enable us to continue with our work at Carnforth, and get 6201 back on the main line.